In deciding upon the design for an entire house all at once, some people like to pick a clear concept that will work in every single room and make sure that that unifying idea is clear to see throughout the building. For others, having a plan that will suit the house as a whole is less important that making sure each room contained within it functions autonomously. This very pretty, very liveable apartment in Hong Kong, by Nicole Cromwell Interior Design, falls squarely into the latter category. There’s no easily definable style or colour scheme consistently at work in each room – though none of the rooms jars with the others – but the house seems cohesive because every individual space is confident enough just doing its own thing. Contrast is key in this room, where the bright blue fabric of the chairs’ seats provide a much needed injection of colour to a palette heavily dominated by dark wood tones. 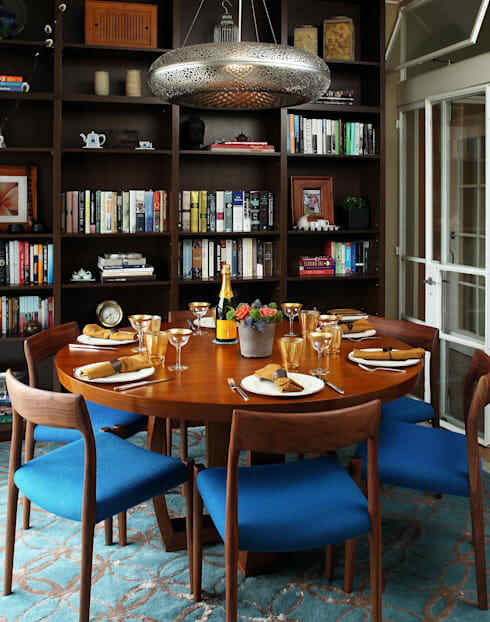 The dining room, in any home, is also the ideal spot for a full-wall set of shelves, as seen here. Not only does a piece like this act as a naturally decorative background, negating the need to select large pieces of artwork for the room if you don’t feel like doing so, it also gives you the opportunity to display all the interesting bits and bobs that can act as valuable icebreakers during dinner parties; beloved books, for example, or interesting knick knacks collected on your travels. 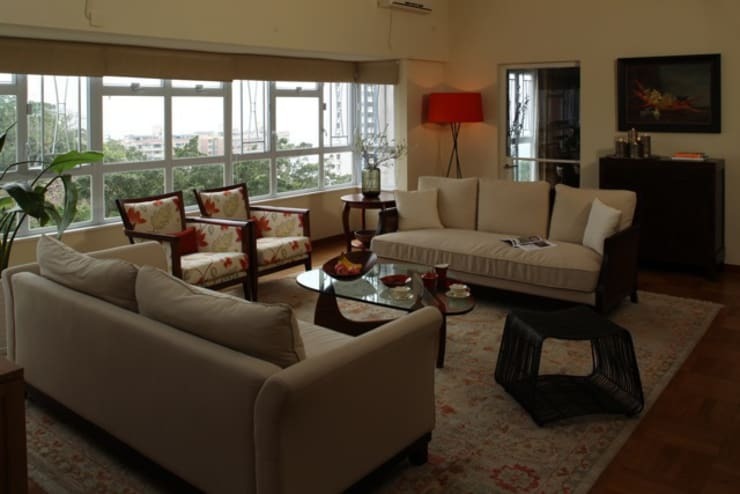 This is the “good” living room – in other words, it’s the living room best suited to hosting guests who are still unfamiliar enough that you need to go the extra mile to impress them. There is also a second living room not pictured here, which is a little less showy. Here, however, quiet good taste and people-pleasing neutrals are the order of the day. Furnishing the room entirely in creams and beiges would result in too tame a look, however; that’s why the lamp and the patterned chairs are included, livening things up with splashes of daring red. Simple lines and sleek, sensible storage make this a practical, pleasingly understated workspace. Distractions are few, with colour accents again kept to just a few small splashes of a single colour – in this case that summery sky blue. 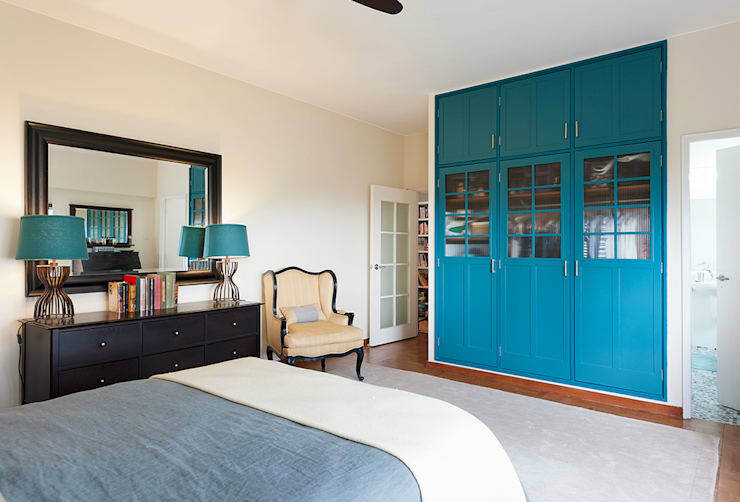 The colours chosen for this room are, as elsewhere, few; as elsewhere, however, they are also perfectly complementary. 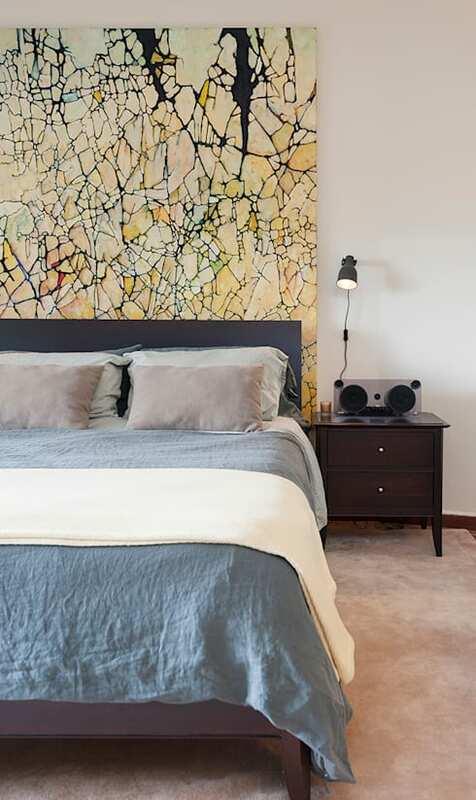 The cracked yellows of the striking painting that acts as a second, oversized headboard are extremely effective in enhancing the blue-grey bedding and adding warmth to the space. This angle shows that there is in fact a third statement colour at work here: that gorgeous turquoise-blue that stands out so brightly on the lampshades and wardrobe doors. The rest of the room, however, is kept as muted as one would probably expect based on what we’ve already seen of this apartment. 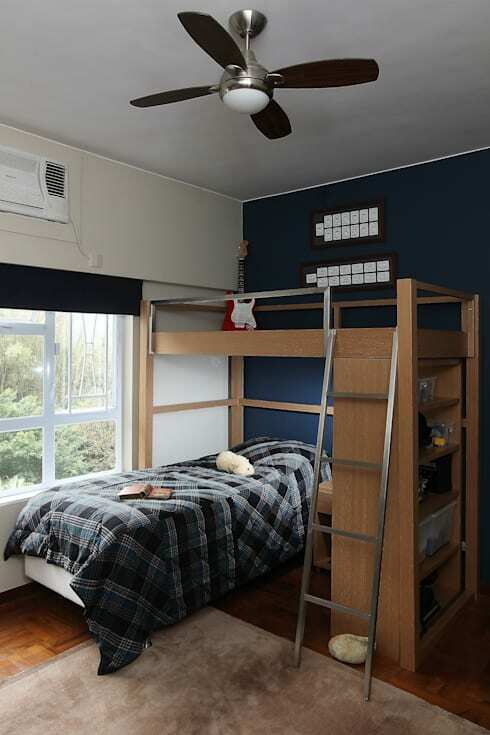 This is a room for a son who most likely isn’t quite a teenager yet, but who is already keen to leave most of the brightly-coloured trappings of childhood behind. Storage has again been a careful consideration here; it’s one of the features of the design of this home that makes it seem so consistently realistic as a family home. The girl who occupies this room is clearly a fair bit younger than her brother, and probably has a more diverse appreciation for colour. 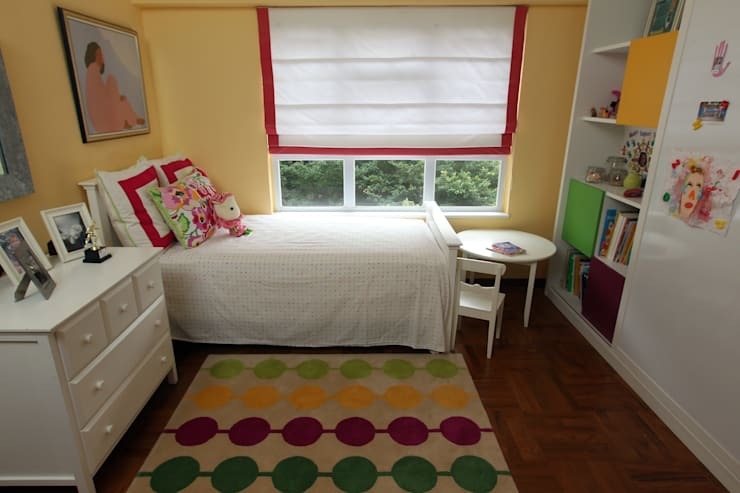 The design of the room embraces this childish attraction to bright things in a fairly restrained way, however; any clashes here are tasteful ones, and the room is as pleasing to grown-up eyes as it is to younger ones. Which room appeals to you the most? Tell us here!